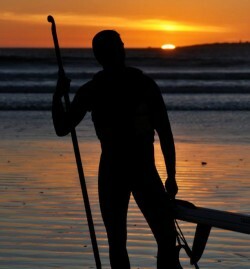 Peter Petersen is SUPracer.com's new South African SUP Correspondent, bringing you the latest Stand Up Paddle race results, news and pics from Cape Town to Durban and everywhere in between. 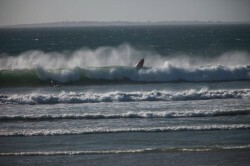 This week the wind gods played along and we managed to run Race #3 of the new PRIMI Naish Downwind Dash series. After last week’s blistering start to the 2015 PRIMI Naish Downwind Series, this week’s edition served up a more modest 15-20 knots but also some solid swells at the finish. 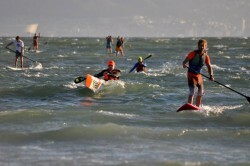 Last Wednesday night, January 21st, marked Week #3 in the new edition of the ten week PRIMI Naish Downwind Dash Series. And *finally* we had some well-timed wind here in Cape Town. After last week’s feisty downwinder saw wind, waves and a broken board, this week’s fifth and final race in the Oct-Dec edition of the long-standing PRIMI Naish Downwind Dash series here in Cape Town, South Africa was another cracker. Race #4 in the October to December 2014 edition of Cape Town’s long-running PRIMI Naish Downwind Dash series was one for the books. 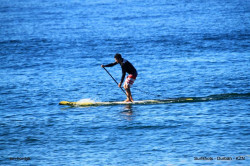 Yesterday’s conditions were good with 15-25 knots of wind and some 3-4ft nuggets greeting paddlers at the start and exit. With Dylan Frick back in town, Ethan Koopmans was frothing to see if he could match him on a decent downwinder after Dylan got one over him on the weekend in the flats. Brandvlei Dam, one hour out of Cape Town, hosted the final race in a series of six counting towards the coveted SUPSA South African Race Championship title. 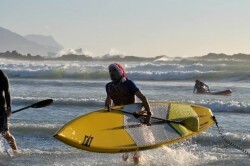 October marks the beginning of summer in Cape Town and with it, the return of the PRIMI Naish Downwind Dash race series. 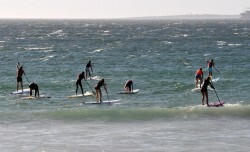 Now in it’s 15th year (with SUP being included for the past five years), the classic Milnerton to Big Bay Downwinder is run every Wednesday night for 10 weeks, from October through mid-December and another 10 weeks from mid-January to March. 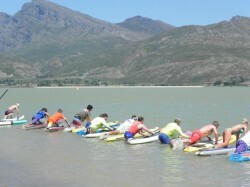 Naish SUP South Africa sponsored and organised the 2nd stop on the South African SUPSA Race Tour last weekend. 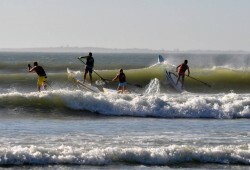 The racing was held in Durban at New Pier and counted towards selection for the 2015 ISA Worlds. With Dylan Frick doing his duty in Europe, it was up to pre-event favorite Ethan Koopmans to fight off the local Durban paddlers.